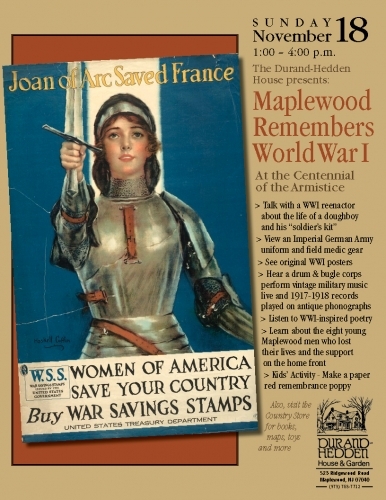 One hundred and one years ago, the United States declared war on Germany, joining the First World War, and the impact was felt in the small town of Maplewood, NJ. Join Durand-Hedden on November 18 from 1pm to 4pm as we learn more about the Great War. At the Durand-Hedden event, visitors can talk with a WWI reenactor portraying a Marine sergeant as he reveals the life of a doughboy and his essential ‘soldier’s kit.’ See the uniform of a soldier from the Imperial German Army and German field medical gear. Hear an authentically attired drum and bugle corps from Early Music and Arts play U.S. military music of the period plus the spirited “Over There,” and meet silent-screen celebrity “Theda Bara” as she speaks about selling war bonds. Enjoy the early twentieth century diversion of 1917-1918 records played on antique phonographs by The Spring-wound Serenaders. Listen to the reading of World War One-inspired poetry by David Burr, a book editor and poet.